Tickets will be available at the box office. Proceeds will benefit the Woodstock Film Festival and Friends of FAFG, a U.S. 501(c)3 tax exempt organization that supports the work of the Forensic Anthropology Foundation of Guatemala, also known as FAFG (www.fafg.org). FAFG is a Guatemalan non-governmental organization that finds and identifies forcibly disappeared and other victims of Guatemala’s 36-year Armed Conflict. FAFG is dedicated to using forensic science as an instrument to recover history, clarity and truth, and to promote justice, combat impunity and build peace. Finding Oscar tells the incredible story of the 15-year search for a 3-year-old boy who survived the infamous Dos Erres Massacre in Guatemala in 1982. Set against the background of Guatemala’s 36-year Armed Conflict, the film features three courageous Guatemalan women – a human rights activist, a young prosecutor and Guatemala’s Attorney General – who unraveled the mystery of what happened at Dos Erres and brought to justice the perpetrators of one of Central America’s worst crimes against humanity. The film also lays bare the U.S. government’s covert support for the violent polices of Guatemala’s government and its Acting President at the time of Dos Erres, General Efraín Ríos Montt, whom President Reagan publicly embraced in 1982. Finding Oscar was made after co-producer Scott Greathead persuaded his childhood friend, Hollywood producer Frank Marshall, that it was a story that had to be told. The film is a Kennedy/Marshall Company production directed by Ryan Suffern. The Executive Producer is Steven Spielberg. 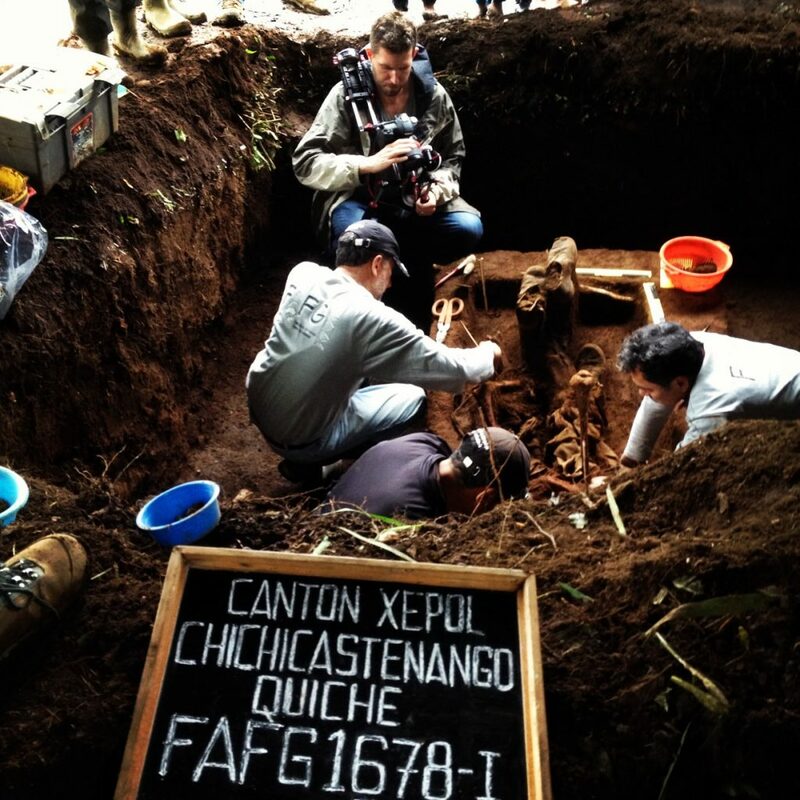 The film was made in association with USC Shoah Foundation, which Steven Spielberg founded to record and preserve the testimonies of Holocaust survivors, and with Friends of FAFG, which supports the work of the Forensic Anthropology Foundation of Guatemala. The screening will be immediately followed by a panel featuring producer and attorney Scott Greathead, the film’s subject Óscar Ramirez Castañeda, and forensic anthropologist Fredy Peccerelli, moderated by Shari Turitz, Vice President for Programs at the American Jewish World Service. Turitz is an expert on the topic of human rights and Latin America, with a focus on Guatemala. Scott Greatheadis a senior counsel in the New York office of the international law firm Eversheds-Sutherland where he practices corporate litigation. He is also an international human rights advocate and a founder of several prominent public interest organizations, including New York Lawyers for the Public Interest and Human Rights First. He has visited more than a dozen countries on human rights fact-finding missions for Human Rights First, Human Rights Watch and other organizations and has written extensively on human rights and corporate social responsibility in The New York Times, The Wall Street Journal and other publications. Óscar Ramirez Castañeda was an undocumented Guatemalan living in Framingham, MA in 2011 when he learned that he was a survivor of the Dos Erres massacre in 1982 after being kidnapped as a 3-year-old by one of the Guatemalan soldiers who murdered his mother and eight siblings. Scott Greathead and a small team of lawyers obtained political asylum in the United States for Óscar on September 19, 2012. Óscar lives in Framingham with his wife Nidia and their four beautiful children, Andrea, Nicole, Oscar Jr., and Dulce. Fredy Peccerelli is a forensic anthropologist and the Director and one of the founding members of the Guatemalan Forensic Anthropology Foundation (www.fafg.org) in Guatemala City, a nongovernmental organization that exhumes mass graves of victims of Guatemala's civil war. USC Shoah Foundation has joined forces with FAFG, to collect video testimonies of survivors and witnesses of the Guatemalan Genocide, which killed some 200,000 civilians in the early 1980s, mainly indigenous Mayans, at the hands of a military junta whose leader was convicted of genocide and war crimes in May 2013. Peccerelli, along with members of his immediate family, has been the subject of repeated death threats as a result of his work. In 1999, he was chosen by CNN and Time Magazine as one of the "50 Latin American Leaders for the New Millennium. In addition to his ongoing work in Guatemala, Peccerelli has conducted exhumations of mass graves in post-war Bosnia and Herzegovina. He testified about this work at the International Criminal Tribunal for the Former Yugoslavia on March 13, 2007. The Woodstock Film Festival is a non-profit, 501c3 with a mission to present an annual program and year-round schedule of film, music and art-related activities that promote artists, culture, inspired learning and diversity. The 19th Woodstock Film Festival will return October 10-14, 2018 with a full lineup of over 120 independent films, panels and special events in Woodstock, Rhinebeck, Kingston, Rosendale and Saugerties.